Ace is actually a member of the Lil' Trouble Teddy gang, the only difference is the head shape and the tail. Aside from those two things the pattern is the same. 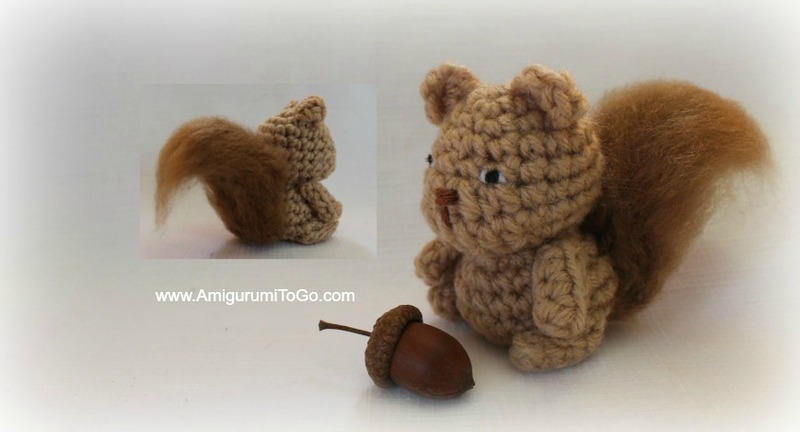 I decided to make the squirrel its own pattern page, this way you don't have to flip back and forth between patterns. part two of the video in the written pattern below. 4.5mm hook for limbs *this is optional, you can use the same hook for the entire project. If you want the ami to be the same size as mine then use what I used. sl st next st and f/o leaving a tail long enough to sew up the gap. Weave in and out of the FLO of the remaining st, stuff the rest of the body firmly and full, shape as you stuff. Use a stuffing stick or the back end of a pencil to push the stuffing into the right spots. If unsure how to shape please view part one of the video tutorial. Pull the yarn tail to close up the gap. Knot off and hide yarn tail inside body. f/o. Fold chain and sew the edges closed, going through one visible loop only of each side. Hide the starting yarn tail inside limb and use the finishing yarn tail to sew the limbs to the body. Do not stuff. brush out tail if you have a pet brush handy. Tip: I would sew the limbs on before crocheting the ears, (instructions for ears is in assembly section), onto the body. I used the arms as a guide, making sure the ears are in line with the arms. 1) Sew the arms just under the neck. Hide the yarn tails inside the body. 2) pin the legs in place, they should be more towards the front so the body doesn't flop over. Sit it down on a flat surface to make sure it will sit up on its own. 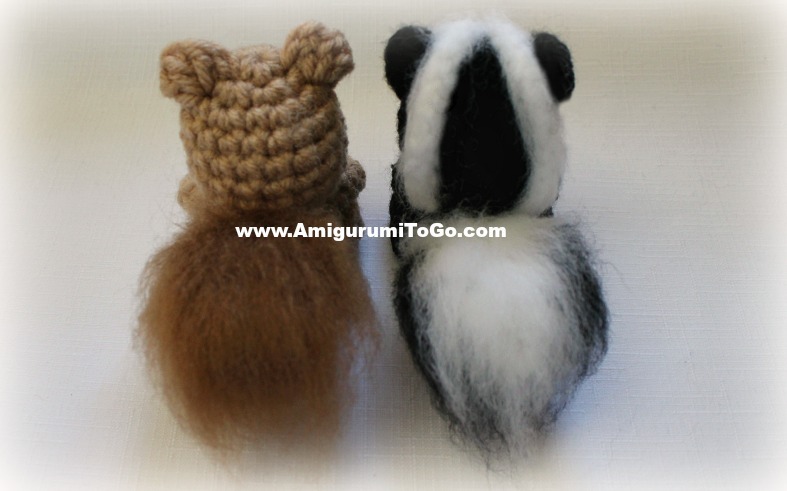 Sew in place and hide yarn tails in the body. ch1 then make 3dc in same space, sl st in the same space or just in front of the last dc you put in. f/o and shape the ear, stretch them out. Hide yarn tails in the head. feel free to play around with different styles and looks. I kept it very simple with black yarn inserted and wrapped in between the 5th and 6th row. I added some white on each side, inserted the same way. See video if you need help. The nose is any color inserted and wrapped around the 6th row and finished off with a vertical line. If you don't have embroidery thread you can split yarn, that's what I did for the eyes. If you need help, see part two of the video tutorial for this part, fast forward closer to the end. And now you're done. I hope you enjoyed the pattern. Post pictures on my facebook page Amigurumi Freely. Or post them on instagram with the hashtag Sharon_Ojala. This is such a sweet litttle squirrel. His beautiful tail makes him special. So cute !!!! Thanks !!! Love love love your patterns! Collecting all of them. Made a bunch of them wish I could send u a picture. Just don't know the computer too well so don't know how. Your amazing and very talented. You have so much patience and your videos are the best. What is that brush that you use on the tail? it's in the supplies list along with hook size and all the stuff to make him. 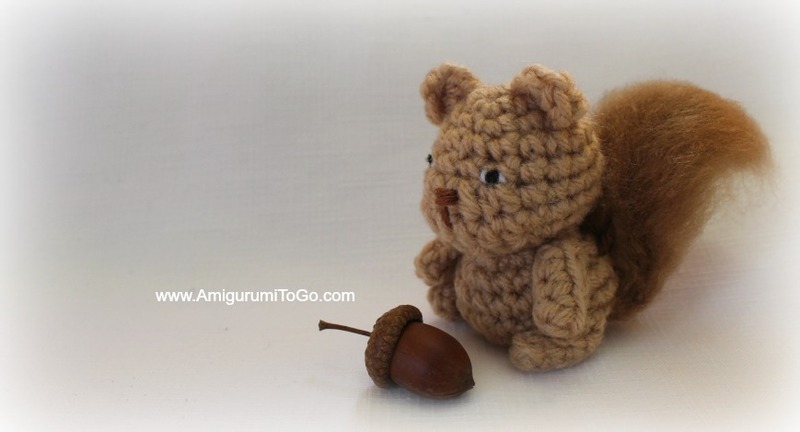 I made the tiny squirrel and I absolutely love him!! I am trying to figure out how to make a larger one so I can have a Mama and baby. Do you have any suggestions for making him bigger?